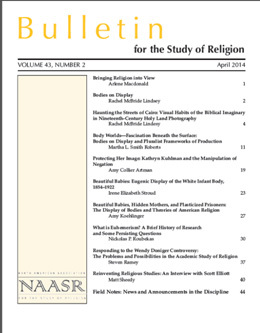 The following is the editorial introduction to the April 2014 issue of the Bulletin for the Study of Religion (the full table of contents having already been posted). We offer this here on the blog in order to give readers an overview of the most recent issue of the Bulletin. This issue’s introduction was written by Arlene Macdonald, our new managing editor. The key problematic of Foucault’s work, Gilles Deleuze posits, is the relationship between seeing and saying, the interplay of discursive formations (the confession, the interview, the examination) and visual apparatuses (the Panopticon, the museum, the diagram) that mutually bring “truth,” knowledge, and subjects into being. The articles that make up this issue of the Bulletin link religion to these varied spaces of practice—the seen and the said—and the cross-fertilization between them. Their analyses attend to what is enunciated (and what is thereby elided), what is shown (and what is thereby shadowed), across a variety of sites, contexts, and modes. They demonstrate, in nuanced ways, how complicit religious actors, religious practices, and religious scholars are in the discursive regimes and visual strategies that constitute norms, construct authenticity, define our objects of knowledge, generate particular ”habits” or practices, and elicit and reward our participation in them. Religion, the body, and the visual apparatus of “display”are the focus for a set of articles in this issue. Irene Stroud examines the display of the white infant body in two early-twentieth-century Protestant practices: baby contests (held regularly at church bazaars and fairs) and infant baptism (a conflux of social and liturgical rituals in that period). Stroud codes both kinds of display “visual spectacles of normalcy,” that produced the white infant body as the cypher of health, respectability, and middle class aspirations. Rachel Lindsay deftly shows how early twentieth century photographic representations of the Holy Land conjoined biblical and imperialist imaginations, fashioning the “truth” of a biblical past, even as the narrative context surrounding the photos directed American Protestant eyes to look past the visual evidence of religious others in biblical lands, or recast them in racially charged ways. Continuing the examination of “bodies on display,” Amy Artman asks how gender was displayed by the pre-eminent evangelical church leader Kathy Kuhlman, whom she describes as both captured by, and capitalizing on, the visual practices that encoded what it meant to be an evangelical Christian woman. How scholars of religion participate in both the discursive and non-discursive formation of our subjects—and our subject—is the concern of Steven Ramey and Nikolas Roubekas. Detailing the surviving fragments and summaries of the work of Euhemerus of Messene of the late fourth and early third century BCE, Roubekas argues religion scholars should be more attentive to the competing discourses that have sought to define euhemerism from the nineteenth century on. Examining the controversy in India surrounding the publication of Wendy Doniger’s book, The Hindus: An Alternative History (2009), Ramey argues that scholars of religion should shift their analysis to the competing discourses that seek to define religious objects or fields (in this case Hinduism), rather than seeking to refine or recast a particular label. In an interview with Matt Sheedy, Scott Elliott reflects on the role of the Council of Societies for the Study of Religion and the CSSR Bulletin (today’s Bulletin for the Study of Religion) in laying the groundwork for engaging religion “in and as discourse, inseparable from so many other social, cultural, and ideological discourses.” Clearly this issue of the Bulletin continues this critically oriented tradition, a tradition I am delighted to be able to participate in. Deleuze, Gilles. 1988. Foucault. London: Athlone. Doniger, Wendy. 2009. The Hindus. An Alternative History. New York: Penguin. This entry was posted in Academy, Announcements, Editorial, Religion and Popular Culture, Religion and Society, Religion and Theory, Religion in the News, Theory and Method, Theory in the Real World and tagged american religion, Amy Collier Artman, Amy Koehlinger, Arlene Macdonald, baby contests, Biblical Imagery, Bodies, Body Worlds, Bulletin for the Study of Religion, eugenics, Euhemerism, Gilles Deleuze, Hinduism, Irene Elizabeth Stroud, Kathryn Kuhlman, Martha L. Smith Roberts, Michel Foucault, Nikolas Roubekas, Rachel McBride Lindsey, Religion, religious studies, Scott Elliott, Steven Ramey, Wendy Doniger. Bookmark the permalink.